DCMI is defined by its community which is responsible for the innovative developments and evolving good practices which DCMI shares with the world. Much of DCMI's work is organised in working and interest groups. DCMI's community is and has always been international, with active participants from around the world. The primary community event is the DCMI Annual Conference. DCMI also organises regular webinars, given by members of the community wishing to share their expertise with like-minded peers. Finally, DCMI collaborates with a number of other organisations. Previously, DCMI has used the term community to describe a long-running group with a shared interest around a particular theme, and task-group to describe a time-limited group with a defined goal. Some variations on this approach have appeared over the years, such as special interest groups. Working Groups are formed when a group of people in the wider DCMI community get together in some shared endeavour - for example to solve a problem, to develop a tool or learning resource, or to explore a specific issue. Working Groups are time-limited, and are led by one or two Working Group leaders. A Working Groups is usually created as an extension of a particular Interest Group, in order to achieve some specific goal identified by that Interest Group. Working Groups can make use of DCMI infrastructure, including git repositories on the DCMI Github account, mailing lists, Slack channels etc. Interest Groups bring together people with a shared interest in a particular domain or aspect of metadata. 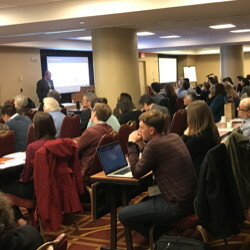 At a minimum, Interest Group members engage in metadata ecology watch by communicating about upcoming events (conferences, workshops and seminars), new metadata initiatives, new metadata tools and best practices as they emerge in the domain of interest. In addition, Interest Groups may form Working Groups to tackle specific challenges. Interest Groups are coordinated by one or two moderators. Each Interest Group has a Web page on the DCMI Web site and a mailing list for discussion and exchange of information. Participation in an Interest Groups is open for anybody who subscribes to the open mailing list.